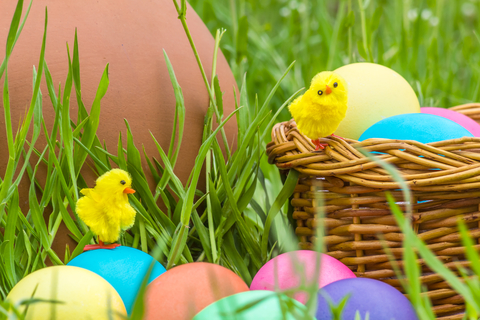 With London Surrey Easter celebrations and the school holidays well underway, this April our Pistachios in the Park cafes are gearing up for some Easter fun throughout London and Surrey. As the weather begins to warm up and the spring flowers brighten up our scenery, planning to get out and about this Easter is a must on the ‘to do list’. Here are some London Surrey Easter ideas to get you thinking, to have some fun with the kids and to plan a day out with friends and family at one of our Pistachio’s in the Park, park locations across London and Surrey. Paper egg cut outs are great for this as you can either make your own by cutting out egg shapes from coloured card or you can buy pre-cut egg shapes from any craft shop. Also, if you younger ones are looking for something to do before your planned ‘Egg Hunt’, you can get them to decorate them. Egg Hunt – Distribute egg cut-outs around a designated area of the park and then ask the kids to find them and collect them up. Once they are all collected, you can offer a small chocolate egg prize. Egg rolling is really fun to do and will get the competitive spirit flowing! A few days before your event, hard boil some eggs and then leave to cool. Once cooled the kids can decorate them using paints. Paint the eggs all over in a solid colour and leave to dry. Once they are fully dried, the children can add patterns – spots, stripes and zig-zag patterns always look fun and bright. On the day of your event, find a hill so that at the top, the children can stand in a line with their brightly decorated eggs. On a countdown of three, get them to let go of the eggs so that they roll the down the hill. The egg that rolls the furthest wins! An Easter picnic is a great way to spend quality time with family and friends, whilst enjoying the outdoors and what better place to meet than in one of our Pistachio’s in the Park, park locations. Fill your Easter picnic up with wonderful Easter treats such as Hot Cross Buns and Easter cakes. Did you know that we sell gorgeous creamy tasting Marshfield Ice Cream in a number of delicious flavours, at all of our Pistachio’s in the Park cafes? You could treat the children to an afternoon out for a Marshfield Ice cream and a play at one of our wonderful parks. All of our parks offer a range of facilities and playtime apparatus to suit children of all ages. They will certainly have fun in and make their own games at the park. If you fancy something warmer or more comfortable then why not meet up in one of our Pistachios in the Park cafes? Our range of home-cooked food includes light snacks, hearty meals, mouth-watering cakes and desserts and offers something to suit all ages, tastes and food requirements. Don’t forget our café partners have been getting creative with their baking this Easter, so pop in for a tasty Easter treat or grab an expertly roasted ‘John Street & Co’ coffee. For more information for what’s on this Easter at Pistachios in the Park, please see our local café pages or contact them directly for more details.